I built a maple sleigh bed. Some of you know that beyond beer and coding, I’m also an active woodworker. In this post, I’m excited to share the completion of my most recent project. Approximately 18 months after buying the first lumber, I’m now sleeping in in my hand-made hard maple sleigh bed. It’s not my first piece of furniture, but it is, by far, the largest and most intricate to date. Despite some amateur imperfections (or are we calling those “artisanal qualities” these days? ), I’m quite happy with how it turned out. It looks good, it sits straight, the matress fits, and it doesn’t squeak! The matress is supported by fifteen poplar slats, each 4 inches wide by 3/4 inches thick, with an inch of space between them. That is to say, there’s no box spring. We bought the matress about a year ago, and we have used a futon frame (also a slatted frame), to support it since then. At “full” size, these slats seem to be fairly firm, but not hard. We like it. The finish is a mixture of one part mineral oil to 4-5 parts beeswax, by volume. It’s not a hard, take-a-beating kind of finish, and it will need to be reapplied from time to time, but we couldn’t resist the beautiful natural color of the maple, the sweet honey smell, and the smooth matte texture. We don’t expect it to need to withstand much more than our touch and the seasonal humidity change anyway. Rumor also has it that the finish and wood should change color with exposure to the sun as the years go by, which will add a great living element to a long-loved piece of furniture. You may notice that there is no metal hardware visible. The headboard and footboard are mortise-and-tenon boxes around a floating plywood panel. Glue and a good fit is all that’s holding them together. Fear not, though, for I am not crazy enough to glue up a piece of furniture that cannot later be removed from a room. The side rails are attached to the headboard and footboard via bolts, but in a sneaky way. The bolts are recessed into the side rail from the inside. They protrude from the end of the side rail, and then pierce the headboard and footboard through a hole on each inner face. A square nut is captured in the tenon of the lower cross rail, to secure the end of the bolt. 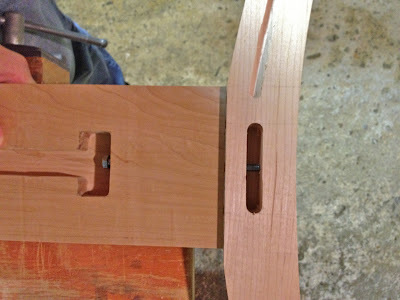 Wood pins also protrude from the end of the side rail, and slot into holes in the headboard and footboard, to prevent the side rail from spinning around the bolt. Beyond connecting the headboard and footboard to each other, the side rail also holds the cleats, which support the slats for the matress. The cleats are attached with good, old-fashions glue-and-screws construction, to ensure they never pry themselves off. The crest rails atop the headboard and footboard are defining features of the bed. 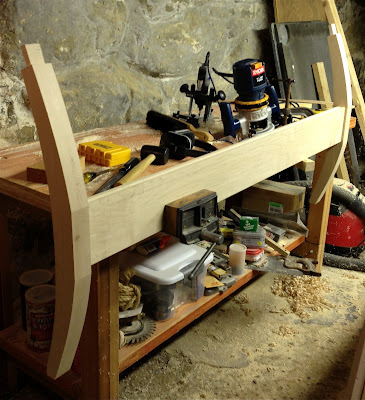 The first question I’m always asked about them is, “Did you use a lathe?” While there was a point, early in the project, that I may have had access to a six-foot lathe, the answer is, no, I did not use a lathe. Instead, I used only my table saw, hand planes, and a pile of sandpaper. After making mortises for the legs, and routing the groove for the face panel (much easier on a square surface), I simply cut the corners off to produce an octagonal prism. I then cut those corners off to produce a 16-sided prism. Using a plane, I shaved the tips of those sixteen corners, then progressed through several grits of sandpaper. Because I decided completion was better than perfection, the rails are not perfect cylinders, but they’re close enough to please the eye and hand. 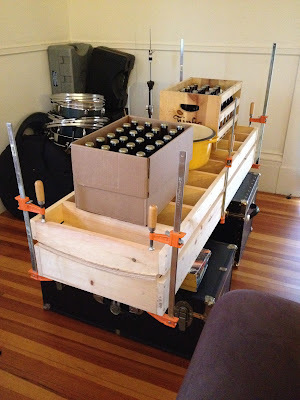 I would be remiss if I didn’t also mention the extra hardware that consumed portions of the living room for several weeks. The face panels in the headboard and footboard are not flat, but instead have a gentle curve to match the profile of the leg. To force the panel to maintain this curve, instead of fighting against it, I built the panel from two sheets of 1/4-inch plywood, glued together and squeezed in a bending form. I did nearly all of the work in my simple basement shop, except for the very first cuts. Most of the wood I bought for this project was surfaced on at most one side. The crest rails are actually two halves of one very thick beam. The early work of surfacing and major cutting, I did in the MIT Hobby Shop. It’s a fantastic place that I never used as an undergrad, but I happily paid for a term of membership as an alumnus. Professional-grade jointer, planer, band saw, sander, etc. made the start of this project possible. It was also inspiring to see many undergrads taking advantage of what I had not, building everything from cabinetry to musical instruments. I purchased the wood at The Woodery in Lunenberg, Mass. Despite having agreed to help a friend move, the operator of the yard stuck around an extra hour to help me sort through their stock to find exactly what I needed. With a great price to boot, I’ll likely be headed back there for my next project. This design is not entirely my own. Beyond the influence of many woodworkers, both past and present, much of my final design is based on Jeff Miller‘s Sleigh Bed from his book Beds. If you’re planning to build a bed of any type, I recommend Jeff’s book, as it covers all of the basics (joinery, mattress support, etc.) with examples in many different styles. What that next project may be, is up in the air. The next few months will likely be spent mostly on small projects that filled the queue while this bed filled the workshop. There are also holiday gifts to plan. After all of that, I’ll begin to consider the next large items on my list. 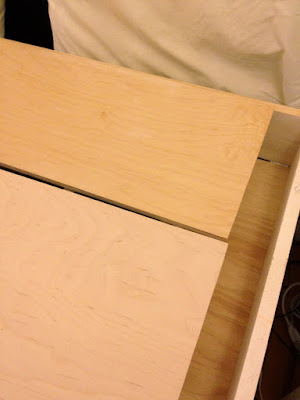 Author BryanPosted on July 20, 2012 Categories Woodworking4 Comments on I built a maple sleigh bed.